The visitors played with the wind behind in the first half. In the opening ten minutes both sides saw good amounts of the ball, however, neither side looked like braking the deadlock. The first shot on target came from Auckland’s Dave Edwards who saw his shot rattle the cross bar and bounce off the line. Shields failed to heed that warning shot as Adam Preston found the top corner of the net with a wind-assisted shot. Just before the half hour North Shields were hit with a scare as Jack Donnison went down with what looked like a hamstring injury. He was substituted with Marc Lancaster coming on in his place. Within seconds the substitute delivered a great cross into the box which caused problems to the visiting defenders and Daniel Richmond turned the ball into his own goal. With the scores level at 1-1, Auckland pushed to regain the lead while holding the wind advantage, but against the run of play a through ball saw Ryan McGorrigan chase it down and as the West Auckland keeper tried to clear it his the Shields striker and he stroked it home to put the Robins 2-1 up at half-time. Early in the second half a shot from Ryan Carr on the half volley hit the upright and bounced out for a goal kick. On the 63rd minute Auckland keeper Gareth Shaw was called into action with Carr hitting a shot which was saved well with an outstretched arm. Then Adam Forster tried to chip the rebound but the keeper made an athletic save to tip the ball over the bar. Shields’ top goal scorer Lee Mason was then brought into action after overcoming an injury as he replaced Richardson. Mason and Carr had good link up play as he saw his shot saved well and went out for a corner. 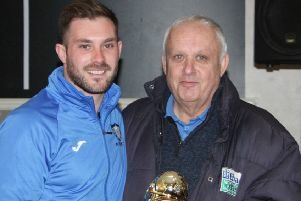 Dean Holmes took the set-piece which was well delivered and was met at the back post by captain Kevin Hughes who scored for the second game in a row. Gareth Bainbridge was then introduced for McGorrigan for the final change of the game. In the final few moments West Auckland went close from a ffree kick only to be denied by a superb fingertip save from Kyle Hayes. North Shields: Hayes, Donnison (Lancaster), Hughes, Coppen, Summerly, Ormston, Forster, Richardson (Mason), Carr, Holmes, McGorrigan (Bainbridge). Subs not used: Parker, Taylor. On Saturday Shields are at Ryhope CW before they entertain Penrith at home on Wednesday, October 5.